If you're a seasoned filmmaker, the two riskiest projects you can helm are sequels and remakes because regardless of what winds up in the final edit or lands on the cutting room floor, to both audiences and critics alike you're damned if you do and damned if you don't make your film similar in tone, style and presentation to the one that came before it. Of course, the one major exception to the remake rule is the rare cinematic occasions wherein directors take on material that wasn't originally intended to be filmed such as great literature. But for the most part, it seems that in the war for the biggest box office buck the creative well that directors return to time and time again is the one overflowing with movies of the past. And unless you're Gus Van Sant making an intentional shot-by-shot remake of Alfred Hitchcock's Psycho seemingly as a technical and personal do-it-yourself-film-school exercise, then although the terms may vary, most of the time the outcome for sequels and remakes is that you're either too boring or too bold. 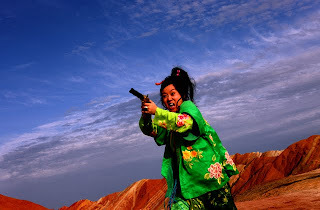 But Zhang Yimou's bizarrely misguided opus to reinterpret the Coen Brothers' contemporary neo-noir crime classic Blood Simple as though it were a farcical, over-the-top tragicomic Chinese opera manages to warrant both responses. Par for the course of Yimou's uniquely epic brand of artistry, the decision to stage what is essentially a chamber piece with the same scope used in his martial arts masterpieces, Hero and House of Flying Daggers , is far too bold and makes you wonder what happened to his penchant for neorealist-inspired pictures like Not One Less and The Road Home . Yet after a good twenty chaotic minutes have gone by and you realize he's not actually kidding by allowing the actors the freedom to swing for the fences in overly broad performances that are laughable-in-all-the-wrong-ways, you find you're numb to the boldness. Thus, boredom and doom sets in with the realization that you have more than an hour more of this same unwanted shtick to go until the final credits. 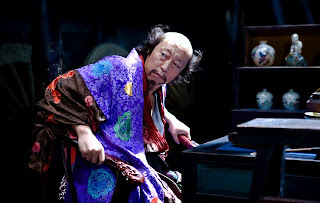 And perhaps, given Yimou's specific homage to the vintage Chinese opera San Cha Kou in his overall goal to give the work a very "rich Chinese flavor" by also utilizing China's comedic super-star Xiao Shenyang, those of us unfamiliar with the influences and the culture just might be missing his point completely. 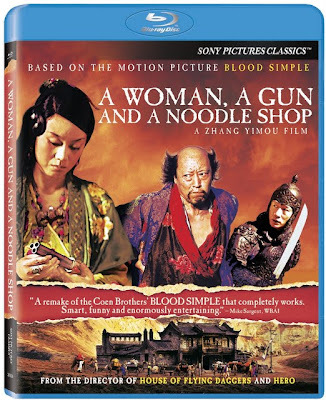 Namely, unlike Yimou's extraordinary work over the past two decades including To Live and Raise the Red Lantern , there's absolutely nothing about A Woman, a Gun and a Noodle Shop that has the potential crossover appeal to strike a chord with audiences in other parts in the world. At its core, it uses the basic premise of Blood Simple in its tale of infidelity, lust, theft, murder and misunderstandings that results in a deadly battle for survival where characters' fates change from one scene to the next. 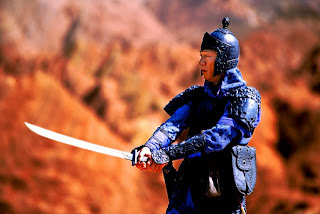 Tragically however and most likely owing to the fact that as Yimou admitted in the production notes that he'd only actually seen Joel and Ethan Coen's filmmaking debut once over twenty years ago, he ultimately misses the spirit of what made (and still makes that film) so compelling to viewers. And because it seems so improbable that a filmmaking genius like Yimou would actually commit to remake a film he's only seen once even if he didn't write the screenplay, I found myself wondering if this was all some sort of elaborate prank, especially when the credits listed numerous assistant directors and a comedy director – the total of which nearly outnumbered the incredibly tiny cast. 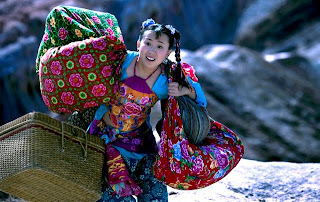 Perhaps, the overall mess was the result of too many cooks in one Noodle Shop but the recipe's awkward blend of slapstick and tragedy results in a garish, incomprehensible presentation that routinely detracts from Yimou's gorgeous shot composition and visual trickery. Yet it's salvaged from complete disaster thanks to a genuinely amazing reinterpreted homage to the 1984 film's tense final showdown between the eponymous Woman and the killer. 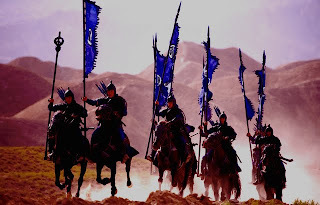 While it still doesn't make Yimou's roughly ninety minute Noodle worthwhile, the Coen Brothers would've been undoubtedly proud of the way that Yimou infused this particular Blood filled scene with Simple boldness that we only wish he would've channeled throughout all along... in addition to (of course) watching the original even just one more time.